Choose the right plan for you based on our daily capacity (number of slides we can design for you per day). 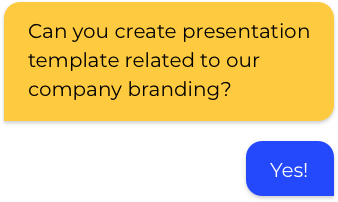 From template development to complete redesign, we can handle all your presentation-related requests. Once we're done with your presentation you can ask for revisions or send us another presentation-related request. Isn't this wonderful? Not sure if we're a good fit for you? Let us design 3 slides of your first presentation request for free. Apply here. So, if I pay $199, I can ask for unlimited revisions and unlimited presentation requests during the whole month? Are you for real? What kind of design quality can I expact? Take a look at the samples of our work above. We have some really good designers in-house and will do our best to satisfy your needs. After all, we want to keep you as a recurring customer. What if I still wouldn't be happy with the results? Then we will refund your money. No questions asked. 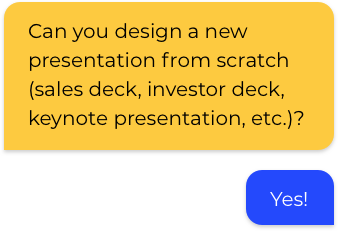 What kind of presentations can you design? Any kind of presentations: sales decks, investor decks, company presentations, keynotes, etc. Can you help with presentation content also? At the moment we can help you only with a design. How about the delivery format? We can deliver presentations in PowerPoint, Keynote or Google Slides formats. How about animation? Is this feature included in price plan? Not at the moment. But we may help for a little charge. Feel free to contact us first. Depends on your payment plan. For the Basic plan, you can expect delivery of 18 slides deck in 6 days. If you choose Premium - we'll deliver the deck in 3 days.